The homemade dressing is just as simple, and it takes this salad to the next level of salad greatness. 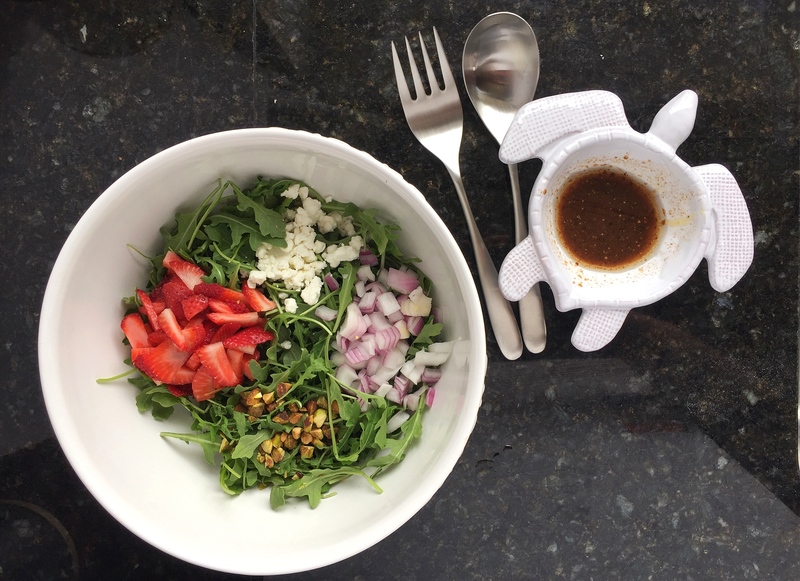 It’s a simple balsamic dressing made with two parts olive oil and one part balsamic vinegar. I also threw in a touch of honey, dijon mustard, and salt and pepper for good measure. One note to call out sooner than later, if you are looking to make this a full meal I would add some sliced chicken breast on top. This Spicy Soy Sauce Basil Chicken would work really well. If you only want this salad as a side or an appetizer then you can probably go sans chicken and it will work out. I had this as a nice appetizer before dinner on Sunday night. ‘Twas good. All of the ingredients in this salad are stars. They’re like the 2019 Cubs, everyone has a roll to play. Though, if one ingredient did stand out, it would definitely be the goat cheese. For one, goat cheese is delicious. More importantly though, in this salad particularly it really comes alive when mixed with the dressing and helps make everything a little more creamy and delicious. The great part about this salad is you can customize it however you want to! I definitely recommend you stick with the ingredients below (they work great together), but if you have pecans instead of pistachios, or enjoy feta more than goat cheese, or saw that blueberries were on sale not strawberries, then make the swap! The best part of cooking at home is that you can prepare food however you want. No need to feel self conscious asking the waiter to make a sub. The dressing will run you $0.47, bringing your salad total to $4.01. If you are looking to get two full meals it will cost $2.00 per person, but if you are just using it as a side dish or appetizer you can get about 4 servings out of this or $1.00 per serving. If you decide to add chicken breast, it will cost you about $3.24 additional (for 1/2 lb). This would bring the salad to $7.25, or $3.63 per person for two full salads. When was the last time you saw a salad with goat cheese AND strawberries AND pistachios AND fresh chicken breast for under $10, let alone under $5! These are savings I can get excited about. This Spring Arugula Salad with Homemade Balsamic Dressing is fresh and healthy. Start by prepping your salad ingredients: slice your strawberries into thin slices, finely chop your onion and roughly chop your pistachios. Then add them all to a large mixing bowl with the arugula and goat cheese. Next, prep your dressing by adding all the ingredients to a small bowl and whisking together thoroughly. You want the oil and balsamic to combine. Lastly, bring it all together by pouring your dressing over your salad and tossing to incorporate. I hope you enjoy this Spring Arugula Salad with Homemade Balsamic Dressing! This is something I can’t say no: Arugola! This salad sounds so delicious, I have to make it. Thanks for the inspiration!